FROM fledgling painter to in-demand exhibitor, Sarah Bowkett’s journey from canvas to display has been nothing short of incredible – so much so that she has attracted the attention of national broadcaster Prime7 on the eve of her maiden exhibition on Friday September 14 through to Friday September 21 at the Parkes Shire Library foyer. 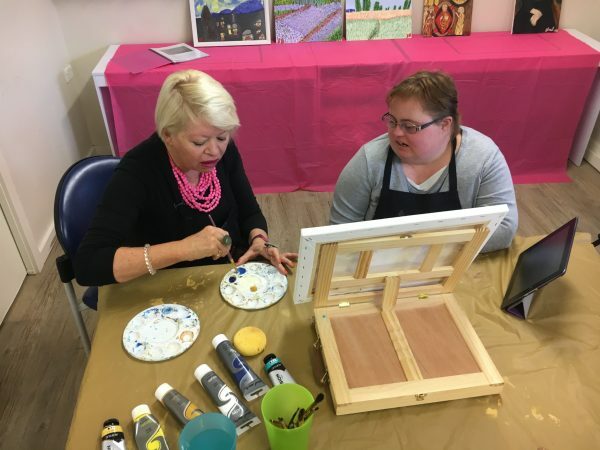 Guided by renowned art therapist Maralyn Nash, Sarah has gone from strength to strength not only as an artist but also with her confidence and self-belief. “She has come along in leaps and bounds,” said Service Delivery Manager Jodie Turner. “From being apprehensive about pursuing her painting to producing some memorable creations Sarah has really thrived under Maralyn’s mentoring. “It is testament to not only Maralyn’s amazing rapport and skills but Sarah’s willingness and dedication,” said Jodie. Speaking in her art room sanctuary at Currajong before her first to-camera interview with Prime7 Central West, Sarah was jovial and relaxed about the exhibition. “When I draw I feel free to express myself without anyone telling me what to do,” said Sarah. “I really enjoy time with Maralyn. “Being around Maralyn is as good as painting,” she said. Sarah is currently working on a painting of Dolphins inspired by the famous Dolphin fresco from the ancient Palace of King Minos, Knossos, Crete. “As background, all of Sarah’s paintings have been inspired by different periods in Art History,” said Maralyn. “From Expressionism – Vincent Van Gogh, French Impressionism – Monet, Byzantine – Religious icons and Italian Renaissance – the Mona Lisa painting – Sarah has been trying it all.